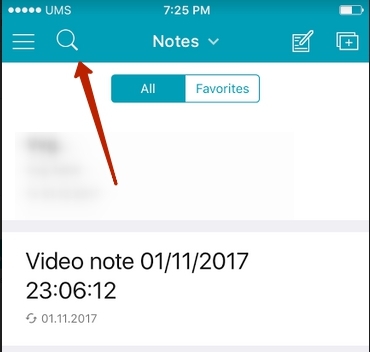 How to find a note through the search? 1) Press on the search icon. 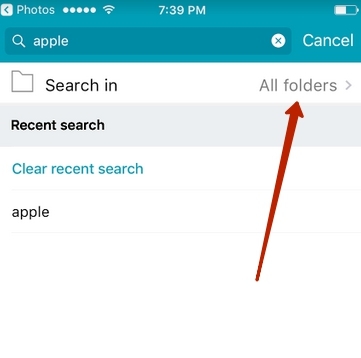 2) If you need to search in a specific folder, select it through Folders. 3) Enter the required word in the search field and press Search on the keyboard. Notes - a list of notes containing the word(s) you entered. Nimbus Note searches through text as well as images (available only to Nimbus Pro users). 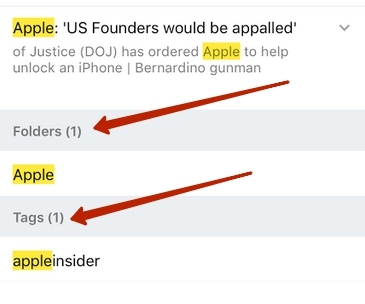 Text fragments with the words being searched for can be viewed in the search results. If there are several fragments, you can view them all by pressing on the arrows next to the note titles. You can go to any note by tapping on its title. 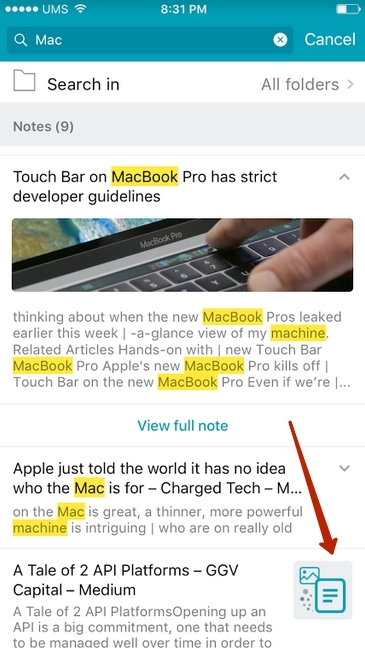 By default notes are displayed with a preview in search results. If a note contains an image with the searched for word, such an image will display on the list of search results. If the image has not been downloaded yet, you will see an icon for it. Folders, Tags - here you will see folders and tags that contain words being searched for. How does document search work? Document search works in a way similar to image searching. 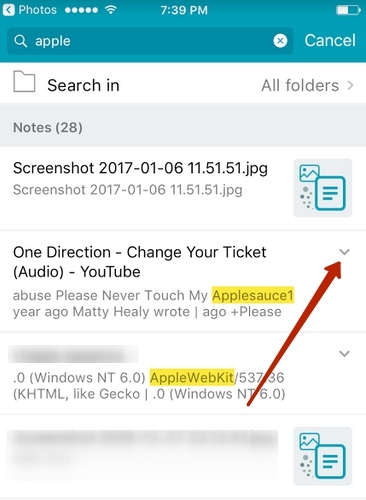 You add a file to your note and it gets sent to the server, becoming available for searching through after some time. 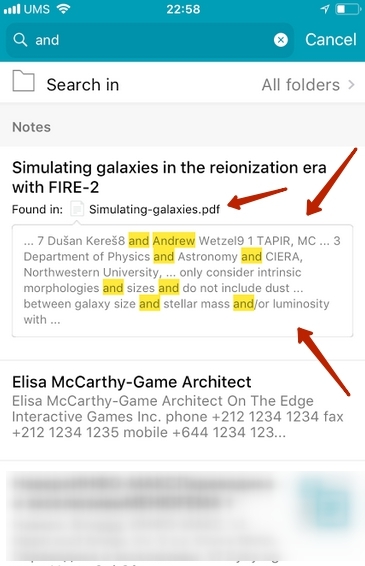 During a search, the text from searched documents is placed inside special outlines, so you can go straight to the needed document by tapping on the text. Nimbus Note searches through the following types of documents: doc, docx, pdf, txt, xml and so on. These are words you already searched for through your notes in the app. You can run a search with any of them again by just tapping the word you need. How does search for text in images work? Only Nimbus Pro users have access to searching for text in images. All your images (from regular notes, screenshots or saved articles from the internet) are run through a special script on the server, after which text from the images becomes available for searching through. Processing such images takes a certain amount of time, so you need to give it some time before searching through the text in your images. Searching for text in images is only available to users with a Nimbus Pro account. When searching I see an arrow in some results. What is it there for? When searching, you can view the results right on the result page. If there are several fragments with the word being searched for, only one will be shown. You can see the rest by tapping on the arrow next to the note title. hello OR world - shows notes containing at least one of the searched words. hello -world - if you put a hyphen before the word, notes with this word will be excluded from the search results. "hello world" - If you put a word of a phrase between quotation marks, search results will show just the notes containing those words in the same order they come between the quotation marks. aaa << bbb << ccc - Will show just the notes where the words come in the same order you wrote them in the search query. 2) If you added the note only recently, it might not have been indexed yet and you need to wait for 10 to 30 minutes for that to happen. The same applies to images and documents. 3) See if Refine/Advanced Search is enabled. If it is, then clear search filters. 4) Make sure you are not using search filters like double quotation marks. If you are, try getting rid of them. 5) If you are using long queries of 3-4 words, try reducing them to 1-2 words. My search returned a lot of notes. How do I narrow the search? 1) try using Advanced/Refine Search. That way you can search only in specific folders or by specific tags. 2) Use our special search queries. That way you can search through note titles or just images. You can red more about it by following this link - https://everhelper.desk.com/customer/en/portal/articles/2373411-search-operators. 3) Try using more precise queries of 2-3 words. If you are using a single-word query, you will most likely get a lot of results.